In addition a smaller but significant number of people (over 250) suggested specific green spaces that they think should be protected from development, including some areas in the countryside and some in the built up area. 105 people reiterated that they wished to protect all remaining green spaces. 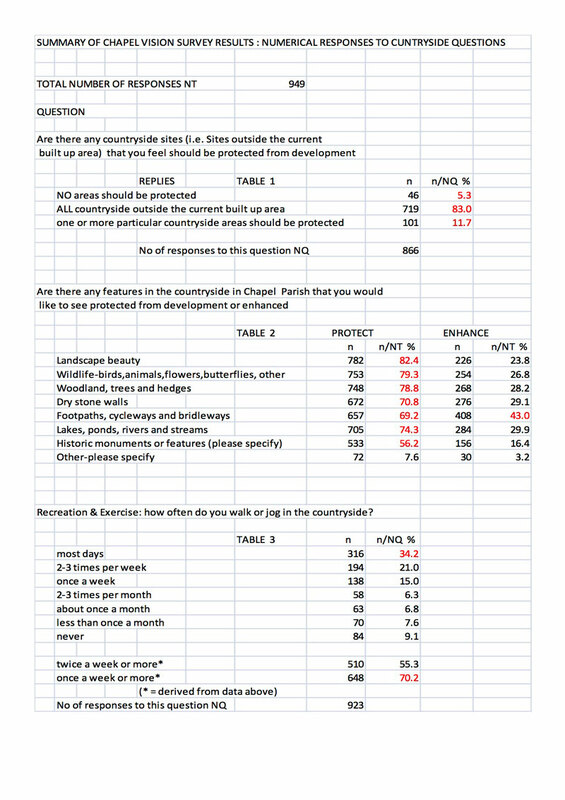 When asked, are there any features in the countryside of Chapel Parish that you want to protect, the great majority of people indicated a wish to protect all of the features listed in the question (see Table 2 below). 82% wanted to protect the beauty of the landscape and 79% wanted to protect wildlife in the Parish. Walking in the countryside is an important form of recreation and exercise for most Chapel residents and many visitors. 70% of all the local people surveyed walk or jog in the countryside at least once a week and 34% did so on most days (see Table 3 below).